01/16/2016: Added Proto  Waterpump Pliers. 07/31/2011: Added Proto 1246 Combination wrench. 05/20/2011: Added Proto 202 6 Inch Thin-Nose Combination Pliers and Penens 3158 8 Inch Combination Pliers. 04/15/2011: Added a Proto 712-S Adjustable Wrench. 04/14/2011: Added a Proto WF-38 1/2-Drive Ratchet. 04/05/2011: Added a T.A.C. 9031 1/2-Drive Ratcheting Crowfoot Wrench. 02/25/2011: Added a P&C 2528 Box-End Wrench. 02/08/2011: Added a P&C 1712 Adjustable Wrench. 11/01/2010: Added a Proto "Los Angeles" 3030 Open-End Wrench. 10/27/2010: Added a Fleet 4008-S Adjustable Wrench. 10/03/2010: Added a Penens 13/16x7/8 Offset Box Wrench. 09/30/2010: Added a Penens 6332 Offset Box Wrench. 07/10/2010: Added a T.A.C. 9042 1/2-Drive Ratcheting Crowfoot Wrench. 06/25/2010: Added a T.A.C. 9036 1/2-Drive Ratcheting Crowfoot Wrench. 06/23/2010: Added a Proto 242-G 8 Inch Tongue-and-Groove Pliers. 06/21/2010: Added a Proto 3720 Single-End Flare Nut Wrench. 09/29/2009: Added a Proto "Los Angeles" 3712 Single-End Flare Nut Wrench. 09/27/2009: Added a Proto "Los Angeles" 1220 Combination Wrench. 09/23/2009: Added a Proto 3718 Single-End Flare Nut Wrench. 09/22/2009: Added a Proto 3712 Single-End Flare Nut Wrench. 09/19/2009: Added a Proto 1126 Box-End Wrench. 08/15/2009: Added a P&C 1708 8 Inch Adjustable Wrench. 08/05/2009: Added a Proto "Los Angeles" 1216 Combination Wrench. 05/14/2009: Added a Proto 6735 Valve Adjuster. 04/20/2009: Added a Proto "Los Angeles" 1212 Combination Wrench. 04/13/2009: Added a Proto 500M 1/4-Drive Ratcheting Crowfoot Driver. 04/12/2009: Added a Proto 500 Ratcheting Flare Socket Set. 04/10/2009: Added a Proto 5449 1/2-Drive Ratchet. 03/18/2009: Added a Proto "Los Angeles" 1224 Combination Wrench. 03/17/2009: Added Proto  8 Inch Tongue-and-Groove Pliers. 03/16/2009: Added Proto "Los Angeles"  6 Inch Combination Pliers. 03/09/2009: Added a P&C 1243 Tongue-and-Groove Pliers. 03/07/2009: Added a Proto 243 Tongue-and-Groove Pliers. 03/06/2009: Added a Proto "Los Angeles" 708-S Adjustable Wrench. 03/04/2009: Added a Proto "Los Angeles" 3348 Obstruction Wrench. 03/03/2009: Added a Proto 3336 Obstruction Wrench, a Proto "Los Angeles" 3364 Obstruction Wrench, and a T.A.C. 9011 3/8-Drive Ratcheting Crowfoot Wrench. 02/17/2009: Added a Proto "Los Angeles" 1226 Combination Wrench. 01/31/2009: Added a Proto "Los Angeles" 1130-L Box Wrench. 07/04/2008: Added a Proto "Los Angeles" 1214 Combination Wrench. 05/19/2008: Updated patent and catalog tables. 04/07/2008: Added a Proto "Los Angeles" 3040 Open-End Wrench. 04/06/2008: Added a Proto "Los Angeles" 3352 Obstruction Wrench. 04/03/2008: Added a Proto "Los Angeles" 3018 Open-End Wrench. 03/27/2008: Added a Proto 5249 3/8-Drive Ratchet. 03/23/2008: Added Proto 260 Thin-Nose Pliers. 02/24/2008: Added Proto 234 Adjustable Compound-Action Pliers. 02/02/2008: Added a Proto 1224 50th Anniversary Combination Wrench, a Proto 371214 Double-Flare Wrench, and a Proto 8071785 1 Inch Drive Socket. 02/01/2008: Create page, moved Penens to here. 02/18/2007: Added a Penens Chicago 6026 Combination Wrench. 02/17/2007: Added a Penens Chicago Open-End Wrench. 08/23/2006: Added a Penens 1260 3/8-Drive Ratchet. 08/13/2006: Added a Penens Challenger 1/2-Drive Socket. 07/26/2006: Added a Penens Combination Wrench. 07/06/2006: Added Penens 4204 Adjustable Wrench. This page will look at the development of Proto Tools from 1950 onward, together with the affiliated companies and brands that made up the Proto empire. The early history of the Plomb Tool Company leading up to the creation of the Proto brand has been covered in our article on Plomb Tools. In this article we'll focus on events from 1950 onward relating to the development of the Proto brand and the affiliated companies. The Proto trademark was registered by Plomb Tool, with the first use date listed as January 23, 1948. In 1947 the Penens Corporation filed a trademark application for "Fleet Quality Tools" enclosed by a wing-like design, with the first use date listed as August 29, 1947. The trademark was issued as #519,190 on December 27, 1949. In the filing the company listed its address as 2047 South Santa Fe Avenue in Los Angeles, with Albert R. Said as company president. Penens later registered "Socketeer" as a trademark. The tool production for Proto and the affiliated brands is generally easy to identify, as the pieces will be stamped with one of the standard brand names. Manufacturing dates are generally difficult to determine for Proto and the related brands, as no general date code system is known. However, production by the J.P. Danielson division, which included adjustable wrenches, pipe wrenches, pliers, and some economy-grade tools, does appear to have been marked with a forged-in date code. See our article on the J.P. Danielson Company for more information on their date-code system. The following list of observations may help estimate a manufacturing date for some tools. Proto Los Angeles. Early Proto tools (beginning immediately with the post-Plomb era) were marked "Proto Los Angeles", and this provides at least a clue to the production date. A 50th anniversary wrench from 1957 is not marked "Los Angeles", suggesting that this marking was used from 1949 to 1956. Plain Hanging Hole for Adjustable Wrenches. In 1948 adjustable wrenches marked with both Proto and Plomb (PRVTV-PLVMB) were made with a plain hanging hole (without a ridge), instead of the broached hole previously supplied. Penens catalogs from 1951 and 1955 illustrate adjustable wrenches with a plain hanging hole. Penens Chicago with Danielson Data Code. Some Penens tools with forged-in "Chicago" markings have been found with a J.P Danielson-style date code, suggesting that some other manufacturing facilities might have adopted the Danielson date code style. (Pure contract production by Danielson would be more likely to use stamped markings, since these would not require the creation of a special forging die.) Since Danielson was acquired by Plomb in 1947, the presence of a Danielson date code on tools from other Plomb/Proto divisions likely indicates production in 1948 or later. Registered Trademark Symbol for P&C Tools. The P&C logo trademark was registered in 1953, and sometime after this P&C began marking tools with the R-Circle trademark symbol following the company logo. Based on the example provided by a P&C 1708S Adjustable Wrench, by 1955 the R-Circle symbol was being stamped on P&C tools. A 1961 P&C catalog includes illustrations showing the R-Circle registered trademark symbol on some tools. Acquisition of Tubing Appliance Corporation. On September 29, 1955 Plomb Tool acquired the Tubing Appliance Corporation, based on a report in the Los Angeles Times on that date. Name Change to Pendleton Tool Industries. On January 9, 1957 shareholders of Plomb Tool voted to change the corporate name to Pendleton Tool Industries, based on a report in the Los Angeles Times on that date. Clik-Stop Patent. In 1959 (or before) Proto began offering lockable adjustable wrenches with the name "Clik-Stop", using a mechanism based on a 1959 patent. Acquisition of Vlchek Tool Company. On December 18, 1959 shareholders of the Vlchek Tool Company approved the sale of the company's assets to Pendleton Tool Industries, based on a report in the Wall Street Journal on that date. The purchase of Vlchek was completed on January 4, 1960, based on a report in the Los Angeles Times on the following day. Ridge Around Hanging Hole for Adjustable Wrenches. A 1961 P&C catalog shows adjustable wrenches with a ridge around the hanging hole. Ingersoll-Rand Acquisition. On February 29, 1964 Ingersoll-Rand completed its acquisition of Pendleton Tool Industries, based on a report in the Los Angeles Times on that date. Registered Trademark Symbol for Proto Tools. Later Proto tools were marked with the R-Circle registered trademark symbol following the Proto name. Although the beginning date of the marking is not yet known, it appears to have been sometime in the mid 1960s. Our article on the Plomb Tool Company has extensive coverage of the predecessor to the Proto brand. Additional information is also available for P&C Tools. Product information was obtained from catalogs covering the Proto, Penens, Challenger, and P & C brands, as summarized in the table below. Challenger No. C533 1951 Fine Quality Low Cost Tools Penens Corporation in Schiller Park, Illinois. Adjustable wrenches with plain hanging hole. P&C No. 5300 1953 Round-shank box wrench 22xx series still listed. Challenger No. 5550 1955 Fine Quality Tools Penens Corporation in Schiller Park, Illinois. P&C No. 61200 1961 P&C Tool Company Subsidiary of Pendleton Tool Industries. Shows registered trademark symbol on tools. In this section we'll look at some examples of Proto tools. Proto tools were initially identical to the Plomb models except for the markings, with the Plomb name replaced by "Proto Los Angeles". In the following decades the designs and styles of existing models have evolved somewhat, and newer tools have been added to the product line as well. Since the Plomb tool models have been well documented, we'll concentrate on some of the newer or different Proto tools here. Fig. 1. Proto 3018 1/4x5/16 Open-End Wrench, ca. 1949-1956. Fig. 1 shows a Proto 3018 1/4x5/16 open-end wrench with pebbled size fields, stamped "Los Angeles" and "MFD USA" on the shank. Earlier generations of this model marked with the Plomb brand can be seen as the Plomb 3018 Wrenches. Fig. 2. Proto 3030 9/16x5/8 Open-End Wrench, ca. 1949-1956. Fig. 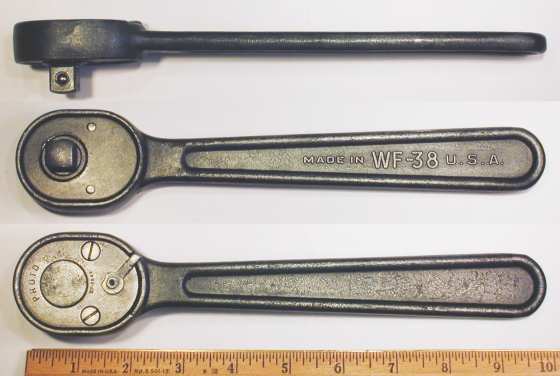 2 shows a Proto 3030 9/16x5/8 open-end wrench with pebbled size fields, stamped "Los Angeles" and "MFD USA" on the shank. The overall length is 6.8 inches, and the finish is chrome plating with polished faces. Fig. 3. Proto 3040 13/16x7/8 Open-End Wrench, ca. 1949-1956. Fig. 3 shows a Proto 3040 13/16x7/8 open-end wrench with pebbled size fields, stamped "Los Angeles" and "MFD USA" on the shank. The overall length is 10.4 inches, and the finish is chrome plating with polished faces. Fig. 4. Proto 1212 3/8 Combination Wrench, with Insets for Side View and Reverse Detail, ca. 1949-1956. Fig. 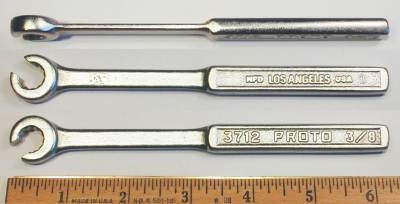 4 shows a Proto 1212 3/8 combination wrench, marked with the sizes forged into pebbled depressions on the shank, and with "Los Angeles" and "MFD USA" stamped on the reverse. The overall length is 4.6 inches, and the finish is black oxide. The pebbled size field design was used on Plomb-marked tools in the late 1940s, and Proto continued to use this style for a few years. Fig. 5. Proto 1214 7/16 Combination Wrench, with Inset for Reverse Detail, ca. 1949-1956. Fig. 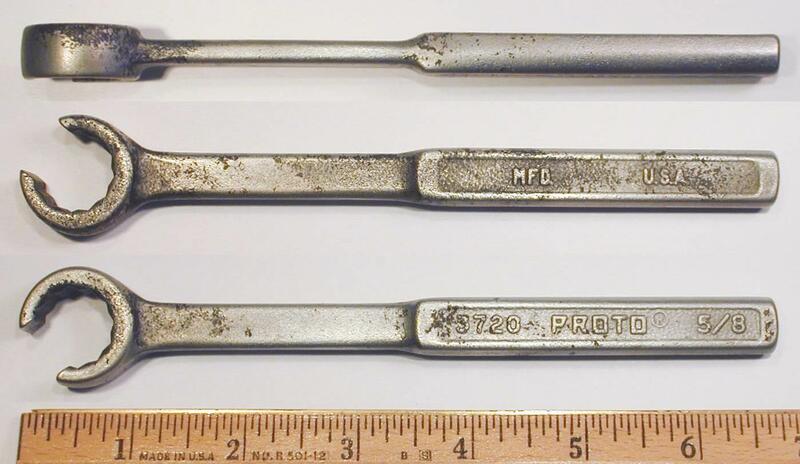 5 shows a Proto 1214 7/16 combination wrench, marked with the sizes forged into pebbled depressions on the shank, and with "Los Angeles" and "MFD USA" stamped on the reverse. The overall length is 5.3 inches, and the finish is chrome plating with polished faces. Fig. 6. Proto "Los Angeles" 1216 1/2 Combination Wrench, with Insets for Side View and Reverse Detail, ca. 1949-1956. Fig. 6 shows a Proto 1216 1/2 combination wrench, marked with the sizes forged into pebbled depressions on the shank, and with "Los Angeles" and "MFD USA" stamped on the reverse. Fig. 7. Proto "Los Angeles" 1220 5/8 Combination Wrench, with Insets for Side View and Reverse Detail, ca. 1949-1956. Fig. 7 shows a Proto 1220 5/8 combination wrench, marked with the sizes forged into pebbled depressions on the shank, and with "Los Angeles" and "MFD USA" stamped on the reverse. Fig. 8. 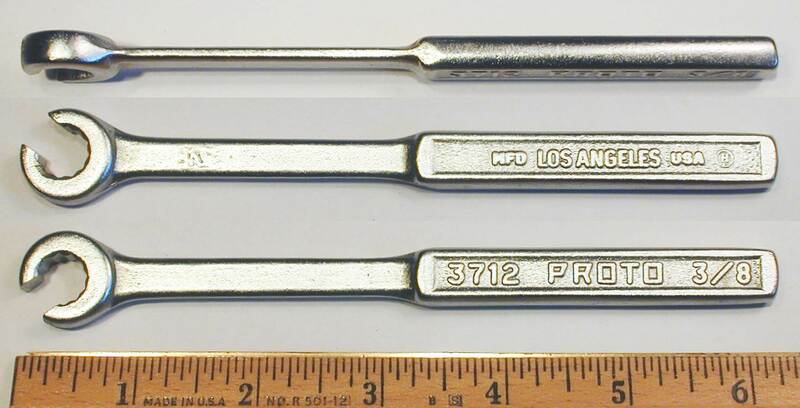 Proto "Los Angeles" 1224 3/4 Combination Wrench, with Insets for Side View and Decal, ca. 1949-1956. Fig. 8 shows a Proto 1224 3/4 combination wrench, marked with the sizes forged into pebbled depressions on the shank, and with "Los Angeles" and "MFD USA" stamped on the reverse. The overall length is 9.3 inches, and the finish is black oxide. Fig. 9. Proto 1224 3/4 Combination Wrench, with Insets for Side View and Decal, 1957. Fig. 9 shows a later Proto 1224 3/4 combination wrench with a 50th anniversary decal, stamped "MFD. U.S.A." on the shank. The overall length is 9.3 inches, and the finish is chrome plating with polished faces. The decal is marked "Pendleton Tool Industries Inc." with "50 Years" and "1907-1957" around the oval design. In addition to commemorating the founding of the company (as Plomb Tool) in 1907, the decal provides a rare indication of the manufacturing date for this tool. Fig. 10. Proto 1226 13/16 Combination Wrench, with Insets for Side View and Reverse Detail, ca. 1949-1956. Fig. 10 shows a Proto 1226 13/16 combination wrench, marked with the sizes forged into pebbled depressions on the shank, and with "Los Angeles" and "MFD USA" stamped on the reverse. The overall length is 10.3 inches. The finish is cadmium plating, with some loss due to wear and rust. Fig. 10B. Proto 1246 1-7/16 Combination Wrench, with Insets for Side View and Reverse Detail, ca. 1949-1956. Fig. 10B shows a Proto 1246 1-7/16 combination wrench, marked with the sizes forged into pebbled depressions on the shank, and with "Los Angeles" and "MFD USA" stamped on the reverse. The overall length is 20.6 inches. The finish is chrome plating, with extensive losses due to rust. Fig. 11. Proto 1126 1/2x9/16 Box-End Wrench, with Inset for Side View, ca. 1949-1956. Fig. 11 shows a Proto 1126 1/2x9/16 box-end wrench, stamped "Los Angeles" and "MFD USA" on the shank, and with the fractional sizes forged into pebbled depressions on the shank. The overall length is 5.4 inches, and the finish is chrome plating. Fig. 12. Proto 1130-L 9/16x5/8 Long Box-End Wrench, with Inset for Side View, ca. 1949-1956. Fig. 12 shows a Proto 1130-L 9/16x5/8 long-format box-end wrench, stamped "Los Angeles" and "MFD USA" on the shank, and with the fractional sizes forged into pebbled depressions on the shank. Fig. 13. Proto 3336 9/16x9/16 Angle-Head Obstruction Wrench, ca. 1957+. Fig. 13 shows a Proto 3336 9/16x9/16 obstruction open-end wrench, stamped "MFD. U.S.A." on the shank. Fig. 14. 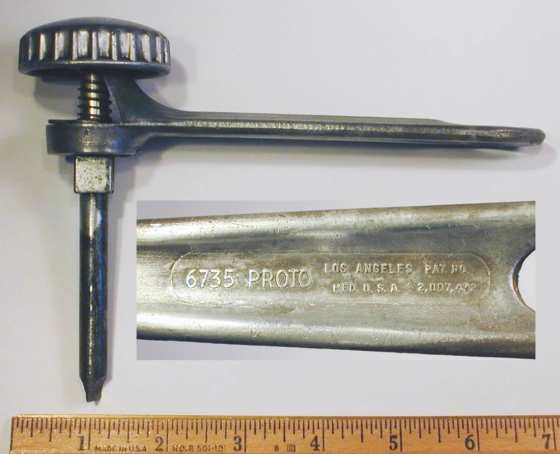 Proto 3348 3/4x3/4 Angle-Head Obstruction Wrench, ca. 1949-1956. Fig. 14 shows a Proto 3348 3/4x3/4 obstruction open-end wrench, stamped "Los Angeles" and "MFD USA" on the shank. Fig. 15. Proto 3352 13/16x13/16 Angle-Head Obstruction Wrench, ca. 1949-1956. Fig. 15 shows a Proto 3352 13/16x13/16 obstruction open-end wrench, stamped "Los Angeles" and "MFD USA" on the shank. Fig. 16. Proto 3364 1x1 Inch Angle-Head Obstruction Wrench, ca. 1949-1956. Fig. 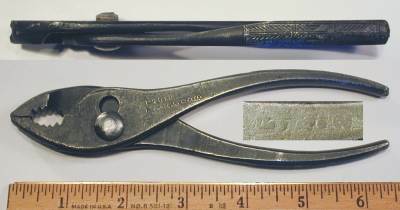 16 shows a Proto 3364 1x1 inch obstruction open-end wrench, stamped "Los Angeles" and "MFD USA" on the shank. The overall length is 8.3 inches, and the finish is chrome plating. Fig. 17. Proto "Los Angeles" 3712 3/8 Flare Nut Wrench, with Insets for Reverse and Side View. Fig. 17 shows an earlier Proto 3712 3/8 flare nut wrench, marked with "Proto" and the fractional size forged into the pebbled handle panel, with "Los Angeles" and "MFD. U.S.A." forged into the reverse. Fig. 18. Proto 3712 3/8 Flare Nut Wrench, with Insets for Reverse and Side View. Fig. 18 shows a later Proto 3712 3/8 flare nut wrench, marked with "Proto" and the fractional size forged into the pebbled handle panel, with "MFD. U.S.A." forged into the reverse. Fig. 19. Proto 3718 9/16 Flare Nut Wrench, with Inset for Reverse. Fig. 19 shows a Proto 3718 9/16 flare nut wrench, marked with "Proto" and the fractional size forged into the pebbled handle panel, with "MFD. U.S.A." forged into the reverse. Fig. 20. Proto 3720 5/8 Flare Nut Wrench, with Insets for Reverse and Side View. Fig. 20 shows a Proto 3720 5/8 flare nut wrench, marked with "Proto" and the fractional size forged into the pebbled handle panel, with "MFD. U.S.A." forged into the reverse. The overall length is 6.7 inches, and the finish is chrome plating, with losses due to rust. Fig. 21. Proto 371214 3/8x7/17 Double-Flare Wrench. Fig. 21 shows a Proto 371214 3/8x7/16 double-flare wrench, stamped "Mfd. U.S.A." on the shank. The overall length is 8.3 inches, and the finish is chrome plating with polished faces. Proto's 37xx series of single-ended flare-nut wrenches are well known, but this style of double-flare wrench is less commonly found. We haven't yet found a catalog reference for this example, suggesting that it might have been a special-order item. Fig. 22. Proto WF-38 1/2-Drive Ratchet, with Insets for Reverse and Side View, ca. Late 1940s to Early 1950s. Fig. 22 shows a 1/2-drive Proto WF-38 ratchet, stamped with "Proto" and "WF-38" plus a small "US" on the cover plate, with "WF-38" and "Made in U.S.A." forged into the shank on the reverse side. The small "US" marking suggests that this tool was made for a government contract. Fig. 23. Proto 5249 3/8-Drive Ratchet, with Insets for Side View and Marking Detail, ca. 1949-1956. Fig. 23 shows a 3/8-drive Proto 5249 ratchet with a knurled handle, stamped "Los Angeles" and "MFD USA" on the cover plate. The overall length is 7.1 inches, and the finish is polished chrome plating. Fig. 24. Proto 5449 1/2-Drive Ratchet, with Insets for Side View and Marking Detail. Fig. 24 shows a 1/2-drive Proto 5449 ratchet with a knurled handle, stamped "MFD. U.S.A." with the registered trademark symbol on the cover plate. The overall length is 10.2 inches, and the finish is polished chrome plating. Fig. 25. Proto 8071785 1 Inch Drive 1-7/8 Socket, with Insets for Construction and Broaching. Fig. 25 shows a 1 inch drive Proto 8071785 1-7/8 socket with a double-hex crossbar opening. This socket is most likely a special-order item, but the specific application is not yet known. Fig. 26. 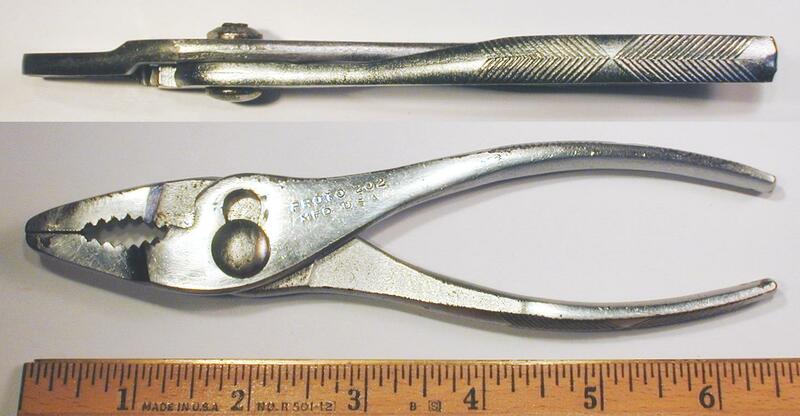 Proto  6 Inch Slip-Joint Combination Pliers, with Insets for Side View and Marking Detail, 1952. Fig. 26 shows a pair of Proto 6 inch combination pliers, stamped "Los Angeles" and "MFD. U.S.A." near the pivot. Although this example is not marked with a model number, these pliers are listed as model 246 in the Proto catalogs. The "Los Angeles" marking places the manufacturing date between 1949 and 1956, and the "2" year digit in the Danielson date code then indicates production in 1952. Fig. 27. Proto 202 6 Inch Thin-Nose Combination Pliers, with Inset for Side View, 1960s+. Fig. 27 shows a pair of Proto 202 6 inch thin-nose combination pliers, stamped "MFD. U.S.A." near the pivot. The inset shows a side view of the pliers, illustrating the "Chevron" gripping pattern on the handles. This pattern appears to have been used beginning in the early to mid 1960s, as a successor to the Herringbone gripping pattern. Fig. 28. Proto 234 "Multi-Plier" Adjustable Compound-Leverage Pliers, with Insets for Side View and Marking Detail, ca. 1957+. Fig. 28 shows a pair of Proto 234 pliers with an unusual adjustable compound-action mechanism. The handle is stamped "MFD. U.S.A." with "Pat. No. 2600512" below. One of the pieces is also marked with a forged-in code "K.7.4" (not shown). The overall length is 8.3 inches, and the finish is polished chrome. The patent notice refers to patent #2,600,512, filed by H.A. Mead in 1947 and issued in 1952. The Proto catalogs referred to this as the "Multi-Plier" and noted the great gripping force of the compound leverage action. Currently our earliest catalog reference to these pliers is from 1954, and this model continued to be available at least through 1962. Fig. 29A. 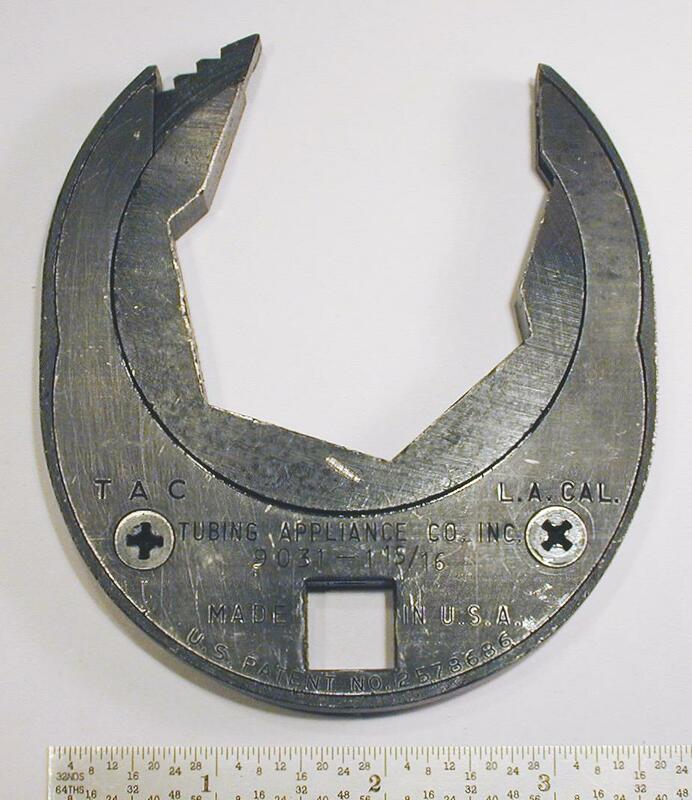 Proto  10 Inch Waterpump Pliers, with Inset for Side View and Marking Detail, 1953. Fig. 29A shows a pair of Proto  10 inch waterpump pliers, stamped "Proto" with "Los Angeles" and "Mfd. U.S.A." below. The handles are also marked with forged-in codes "O-4-3" (front) and "U93" (reverse), with the front code shown as a close-up in the inset. The overall length is 10.1 inches, and the finish is plain steel, with pitting due to rust. The top inset shows a side view of the pliers, illustrating the herringbone gripping pattern. The "Los Angeles" marking places the manufacturing date between 1949 and 1956, and the "3" year digit in the Danielson date code indicates production in 1953. Fig. 29B. Proto 242-G 8 Inch Tongue-and-Groove Pliers, with Inset for Marking Detail, ca. 1960s. Fig. 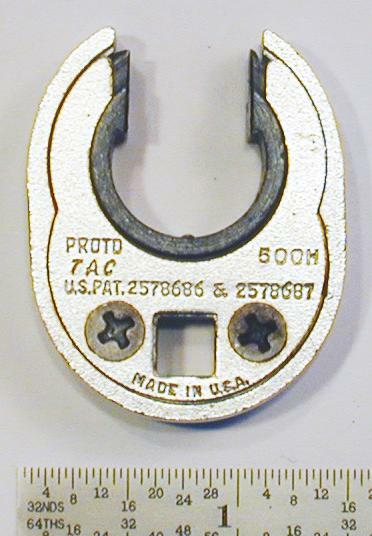 29B shows a pair of Proto 242-G 8 inch tongue-and-groove pliers, stamped "Proto" with the ® registered trademark symbol, with "Professional" and "U.S.A." below. The handles are also marked with forged-in codes "C38" (front) and "B38" (reverse), with the front code shown as a close-up in the inset. The overall length is 7.9 inches, and the finish is chrome plating. The handles are equipped with plastic grips, probably signified by the "G" suffix on the model number. 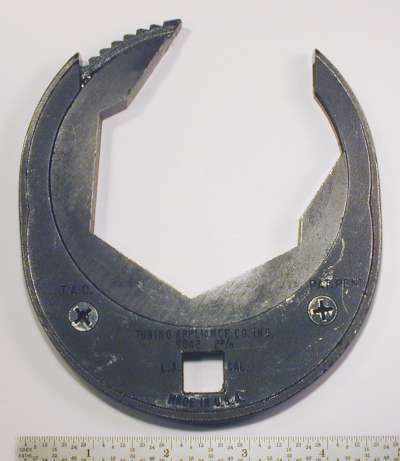 The tongue-and-groove plier design was invented in the early 1930s and sold under the well-known "Channellock" brand by the Champion DeArment Company. Based on a catalog review, Proto was offering tongue-and-groove pliers by 1953 (or earlier), and by 1961 these models were referred to as "Power Track" pliers in the catalogs. Fig. 30. Proto  8 Inch Tongue-and-Groove Pliers, with Inset for Marking Detail, ca. 1957+. Fig. 30 shows a pair of Proto  8 inch tongue-and-groove pliers, stamped "MFD. U.S.A." with "U.S." to the right. The handle is also marked with a forged-in code "S108", shown as a close-up in the inset. Although not marked with a model number, these pliers are listed as model 242 in the Proto catalogs. The "U.S." marking and plain finish suggest that this example was probably supplied for a government contract. Fig. 31. Proto 243 10 Inch Tongue-and-Groove Pliers, with Inset for Marking Detail, ca. 1960s. Fig. 31 shows a pair of Proto 243 10 inch tongue-and-groove pliers, stamped "MFD. U.S.A." and "Proto" with the registered trademark symbol. The handles are also marked with forged-in codes, one handle with "E-10-5" shown in detail in the inset, and the other with a less distinct "B-11-5" (not shown). The overall length is 9.9 inches, and the finish is polished chrome. Fig. 32. Proto 260 Thin-Nose Pliers, with Inset for Side View. Fig. 32 shows a pair of Proto 260 thin-nose pliers, stamped "Los Angeles" and "MFD. U.S.A." near the pivot. The overall length is 6.3 inches, and the finish is plain steel with polished faces. Fig. 33. Proto 708-S 8 Inch Adjustable Wrench, with Inset for Side View, 1953. Fig. 33 shows a Proto 708-S 8 inch adjustable wrench, stamped "Los Angeles" on the shank, and with "Forged Alloy Steel" forged into the shank. The shank also has a forged-in code "X-10-3" visible near the hanging hole. To estimate the manufacturing date of this wrench, the plain hanging hole would place the production in the range 1948-1960, and the "Proto Los Angeles" marking would narrow this slightly to 1948-1956. Within this date range, the year digit "3" in the Danielson date code system indicates production in 1953. Fig. 34. Proto 712-S 12 Inch Adjustable Wrench, with Insets for Side View and Reverse Detail, 1951. Fig. 34 shows a Proto 712-S 12 inch adjustable wrench, stamped with "Proto" and "Los Angeles" on the shank. The shank is marked with "12 In." and "Forged Alloy Steel" forged into the front, with "12 In." and "Made in U.S.A." forged into the reverse. The shank also has a forged-in code "N-9-1" visible near the hanging hole, shown as a close-up in the middle inset. The overall length is 12.2 inches, and the maximum opening is 1.3 inches. The head thickness was measured at 0.70 inches. The finish is black oxide. To estimate the manufacturing date of this wrench, the plain hanging hole would place the production in the range 1948-1960, and the "Proto Los Angeles" marking would narrow this slightly to 1948-1956. Within this date range, the year digit "1" in the Danielson date code system indicates production in 1951. A similar example in the P&C brand can be seen as the P&C 1712 Adjustable Wrench. Fig. 35. Proto 6735 Long-Shaft Valve Adjuster, with Inset for Reverse Detail. Fig. 35 shows a Proto 6735 long-shaft valve adjuster, marked with "Los Angeles" and "MFD. U.S.A." forged into the underside of the handle, and with a "Pat. No. 2,007,432" patent notice. The overall length is 6.9 inches, and the finish is plain aluminum. The patent notice refers to patent #2,007,432, issued to E. Mancuso in 1935. This tool is very similar to the well-known Proto 6734 valve adjuster, first produced beginning in the 1930s as the Plomb 2034 and later as the Plomb 6734 and Proto 6734. This model is fitted with a much longer screwdriver shaft, apparently required for accessing a recessed tappet adjusting screw. In the mid 1950s Plomb Tool acquired the Tubing Appliance Corporation (T.A.C. ), a maker of specialty tools for refrigeration and hydraulic line service. The next two figures show examples of T.A.C. 's line of ratcheting crowfoot wrenches. Fig. 36. T.A.C. 9011 3/8-Drive 11/16 Ratcheting Crowfoot Wrench, ca. 1952-1954. Fig. 36 shows a 3/8-drive T.A.C. 9011 11/16 ratcheting crowfoot wrench, stamped "Tubing Appliance Co." and "L.A. Cal." with a "Pat. Pend." patent notice. The pending status refers to patent #2,691,315, filed by A.J. Brame in 1952 and issued in 1954. Fig. 37. T.A.C. 9031 1/2-Drive 1-15/16 Ratcheting Crowfoot Wrench, ca. 1951+. Fig. 37 shows a 1/2-drive T.A.C. 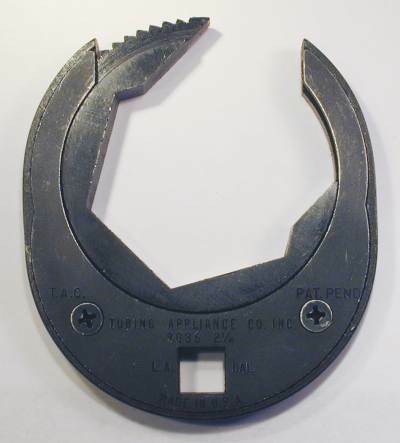 9031 1-15/16 ratcheting crowfoot wrench, stamped with "TAC" and "L.A. Cal." 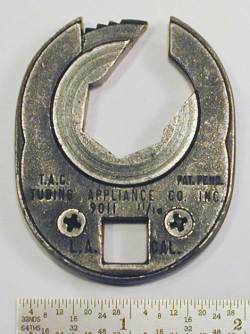 on the top line, followed by "Tubing Appliance Co." and "Made in U.S.A.", and with "U.S. Patent No. 2,578,686" along the bottom edge. The overall length is 4.0 inches, and the finish is black oxide. The patent notice refers to patent #2,578,686, filed by H.L. Fish in 1945 and issued in 1951. This patent was assigned to the Tubing Appliance Corporation. Fig. 38. T.A.C. 9036 1/2-Drive 2-1/4 Ratcheting Crowfoot Wrench, ca. 1952-1954. Fig. 38 shows a 1/2-drive T.A.C. 9036 2-1/4 ratcheting crowfoot wrench, stamped "Tubing Appliance Co." and "L.A. Cal." with a "Pat. Pend." patent notice. The overall length is 4.5 inches, and the finish is black oxide. Fig. 39. T.A.C. 9042 1/2-Drive 2-5/8 Ratcheting Crowfoot Wrench, ca. 1952-1954. Fig. 39 shows a 1/2-drive T.A.C. 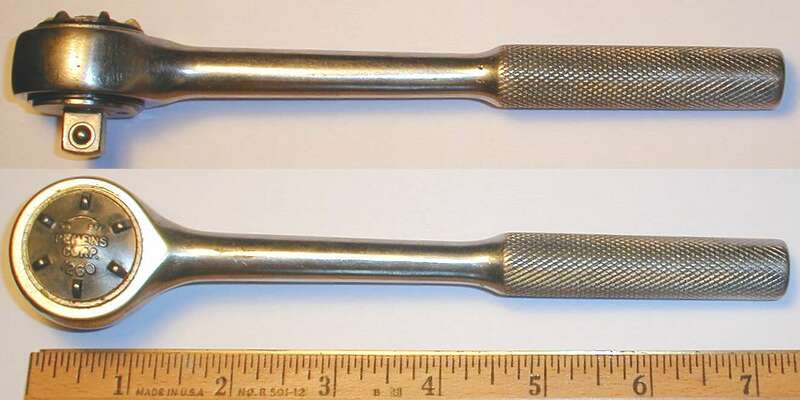 9042 2-5/8 ratcheting crowfoot wrench, stamped "Tubing Appliance Co." and "L.A. Cal." with a "Pat. Pend." patent notice. The next figure shows a clever and unusual application for a ratcheting crowfoot, a specialty socket set with split sockets for use on brake lines or refrigeration fittings. Fig. 40. Proto (T.A.C.) 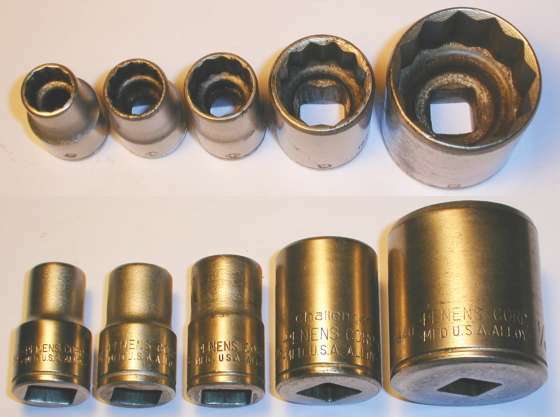 500 1/4-Drive Ratcheting Flare Socket Set, ca. 1955-1960s. Fig. 40 shows a Proto (T.A.C.) 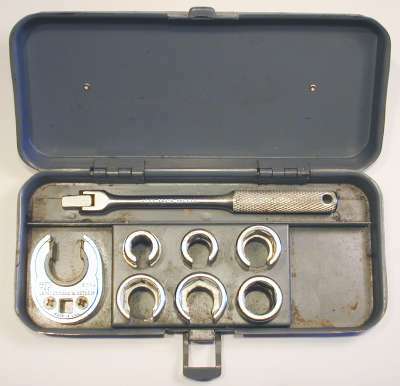 500 1/4-drive ratcheting flare socket set in a custom metal box. The set consists of a 500M ratcheting crowfoot driver, a 4766 flex-head handle, five special split sockets for flare nuts, and one closed socket. The sockets are marked "Proto-T.A.C." with "MFD. USA" and "Patented", and the model number is marked as "500" on all of the sockets. The socket sizes are 3/8, 7/16, and 9/16" in the back row, with 5/9, 11/16, and 9/16 (closed) in the front row. Fig. 41 shows the top cover of the socket set box. Fig. 41. Top Cover of Proto (T.A.C.) 500 Flare Socket Set. Fig. 42. Proto (T.A.C.) 500M 1/4-Drive Ratcheting Crowfoot Driver. Fig. 42 shows the Proto 500M ratcheting crowfoot driver from the model 500 socket set. The faceplate is stamped "T.A.C." and "U.S. Pat. 2578686 & 2578687", with "Made in U.S.A." at the bottom. The patent notice refers to patents #2,578,686 and #2,578,687, filed by H.L. Fish in 1945 and 1947, respectively. Both patents were issued on December 18, 1951 with assignment to the Tubing Appliance Company. The Penens Corporation is known primarily for its operation as a subsidiary of Plomb Tool (and later Proto). We recently discovered (October 2015) that Penens was established in 1941 as a reorganization and renaming of the Cragin Tool (previously Bog Manufacturing) operations acquired by Plomb in 1940. Penens did contract production for Plomb during the war, and afterwards produced tools for several economy lines as part of the Plomb (later Proto) empire. As a subsidiary of Plomb, Penens had an office in Los Angeles, and its manufacturing facility was initially at Menard Street in Chicago, at the old Bog Manufacturing factory. In 1948 the company moved to a larger factory at 3900 Wesley Terrace in Schiller Park, Illinois. A notice for this move was found in a 1948 edition of Chain Store Age. In 1947 Penens registered a trademark for "Fleet Quality Tools" and produced Fleet branded tools for a number of years. In addition to the Fleet brand, Penens also produced tools for the "Challenger" brand, at least up until the early 1960s. A 1951 Challenger catalog lists the Penens Corporation in Schiller Park, Illinois as the company address, and shows the Challenger logo as a gladiator's helmet. However, a later Challenger catalog from the early 1960s lists the company as the Challenger Division of Pendleton Tool Industries, with an address in Cleveland, Ohio. Pendleton Tool was the parent company of Plomb Tool, Penens, P&C, and other subsidiaries, but it's currently a bit of a mystery that Challenger ended up in Cleveland. One possibility is that Pendleton had shifted the production of Challenger tools to the Vlchek factory in Cleveland, after having acquired Vlchek Tool in 1959. By the mid 1960s the Penens Corporation had changed its name to the Fleet Tool Company. This change probably occurred in 1964 or 1965, but we haven't found documentation for the exact date. The company continued to produce tools under the Fleet brand, but presumably without the Penens marking. Fig. 43. Penens Chicago 13/16x7/8 Open-End Wrench, with Inset for Reverse Detail, ca. 1952+. Fig. 43 shows a Penens 13/16x7/8 open-end wrench with depressed panels, marked "Penens Corp. Chicago" and "Mfd. U.S.A." in forged raised letters. The inset shows the forged-in code "PJ.3.2" on the reverse. The type of forged-in code noted on this example is frequently found on Penens tools made in the depressed-panel style. Since the format of the codes matches the Danielson date code system, this suggests that either the wrench were made by Danielson for Penens, or that Penens had adopted Danielson's date coding for their own production. In either case, the "2" year code and "Chicago" marking could indicate production in 1952 or 1962. Fig. 44. Penens 13/16x7/8 Offset Box Wrench, with Insets for Side View and Reverse Detail. Fig. 44 shows a Penens 13/16x7/8 offset box wrench with raised panels, stamped "Penens Corp." and "MFD. USA" on the front panel, with "Drop Forged in U.S.A." and the fractional sizes on the reverse panel. The overall length is 13.8 inches, and the finish is plain steel. Fig. 45. Penens 6332 15/16x1 Offset Box Wrench, with Inset for Side View, ca. 1948+. Fig. 45 shows a Penens 6332 15/16x1 offset box wrench, stamped "Penens Corp." and "Chicago" on the shank. The shank also has a forged in code "D.3.2" faintly visible at the left. The overall length is 14.4 inches. Fig. 46. Penens 9/16 Combination Wrench, ca. 1948+. Fig. 46 shows a Penens 9/16 combination wrench with depressed panels, marked with "Penens Corp. Chicago" and "MFD. U.S.A." forged into the panel. Fig. 47. Penens 6026 13/16 Combination Wrench, with Inset for Reverse Detail, 1957. Fig. 47 shows a Penens 6026 13/16 combination wrench with depressed panels, marked with "Penens Corp. Chicago" and "Mfd. U.S.A." forged into the front panel. The model number "6026" is stamped on the face. The overall length is 10.4 inches, and the finish is chrome plating. The inset shows the forged-in code "B.8.7" on the reverse. The forged-in code on the reverse matches the form of the Danielson date code, suggesting that either the wrench was produced by Danielson, or that Penens had adopted Danielson's date coding system for their production. In any event, the "7" year code and "Chicago" marking indicate production in 1957. Fig. 48. Penens 4204 4 Inch Adjustable Wrench, with Inset for Reverse, 1953. Fig. 48 shows a Penens 4204 4 inch adjustable wrench, stamped "Penens Corp." and "Chicago" on the shank, and with "Forged Alloy Steel" forged into the reverse shank. The shank also has a forged-in code "B 12 3" visible at the right. The forged-in code "B 12 3" is the Danielson Date Code for the tool, and the "3" year code and plain hanging hole indicate production in 1953. Fig. 49. Fleet 4008-S 8 Inch Adjustable Wrench, with Insets for Side View and Reverse Detail, 1950. Fig. 49 shows a Fleet 4008-S 8 inch adjustable wrench, stamped with the model number and "Fleet" logo on the shank, with "Penens Corp. Chicago" on the reverse. The shank is also marked with "8 In." and "Forged Alloy Steel" forged into the front, with "8 In." and "Made in U.S.A." forged into the reverse. The overall length is 8.2 inches, and the maximum opening is 1.0 inches. The finish is plain steel. The front shank is also marked with a forged-in code "E-6-0" near the hanging hole, a Danielson date code indicating production in 1950. Fig. 50. Penens 3158 8 Inch Combination Pliers, with Inset for Side View, ca. Early to Mid 1960s. Fig. 50 shows a pair of Penens 3158 8 inch slip-joint combination pliers, stamped with "Penens Corp." and "Chicago" near the pivot. The top inset shows a side view of the pliers, illustrating the gripping pattern with opposing chevrons. This "Chevron" gripping pattern is apparently the successor to the "Herringbone" pattern used from the early 1940s through 1950s. The handles of these pliers have faint traces of date codes, but we were not able to read the digits. The use of the Penens name indicates production up through the mid 1960s, when the company name changed to Fleet. Fig. 51. Penens 1260 3/8-Drive Ratchet, with Inset for Side View. Fig. 51 shows a 3/8-drive Penens 1260 ratchet, marked with "Penens Corp." and the model number embossed on the shifter. The overall length is 7.3 inches. Our article on Vlchek shows a very similar 1/2-drive Vlchek 3800 Ratchet, likely made by Penens. Fig. 52. Penens 1661 1/2-Drive Ratchet, with Inset for Side View. Fig. 52 shows a 1/2-drive Penens 1661 ratchet, marked "Penens Corporation" and "Mfd. U.S.A." on the cover plate. The overall length is 9.6 inches. The head and shank have been finely ground and polished up to the knurled handle, and the finish is polished chrome. The ratchet mechanism uses a 22-tooth gear with dual pawls controlled by a lobed shifter. Basically this is the same mechanism used in all Plomb-family reversible ratchets, and the soft pawl springs give it a smooth action with minimal back-drag. In our next figures we'll show some examples of sockets made by Penens, including sockets marked both "Challenger" and "Penens". Fig. 53. Penens 1/2-Drive 16xx Sockets, with Inset for Broaching. Fig. 53 shows a collection of five 1/2-drive Penens sockets, each marked "Penens Corp Mfd. U.S.A." and "Alloy". The models and sizes are, from the left, 1614 (7/16), 1616 (1/2), 1618 (9/16), 1626 (13/16), and 1640 (1-1/4). The finish is chrome plating, fully polished for the larger sockets, but with a satin upper part for the smaller sockets with stepped diameters. The inset shows the 12-point broaching with hot-broached construction, and the annular ring of displaced material can be easily seen in the larger sockets. Note that the base of the sockets has a small indented mark resembling a "+" symbol, or perhaps a four-leaf clover. This mark on the outside is opposite a dimple on the inner (drive) wall, and is always centered on one of the drive flats. The dimple helps to secure the socket to a drive stud, as a simple (and probably cheaper) alternative to a drilled hole for this purpose. Sockets for other brands in the Proto family also use a dimple, at least for some of the production, but the mark on the outside is usually something other than a "+" shape. The fourth socket from the left (1626) is marked for both Challenger and Penens, as is the example in the next figure. Our next example shows a tool marked with both the Challenger brand and with Penens as the manufacturer. Fig. 54. 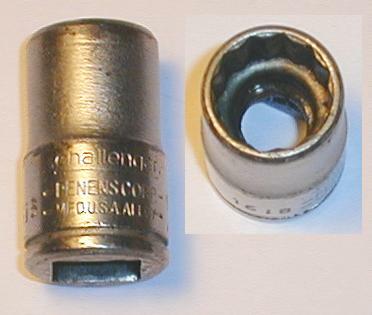 Challenger 1/2-Drive 9/16 Socket, with Inset for Broaching. Fig. 54 shows a Challenger 1618 1/2-drive 9/16 socket, marked "Penens Corp. Mfd. U.S.A." and "Alloy". The inset shows the 12-point broaching with hot-broached construction. The manufacturing date is probably sometime in the 1950s. Fig. 55. Fleet 4210-S 10 Inch Adjustable Wrench, with Insets for Side View and Reverse Detail, 1966+. Fig. 55 shows a later Fleet 4210-S 10 inch adjustable wrench, stamped with the model number and "Fleet" logo on the shank. The shank is also marked with "10 In." and "Forged Alloy Steel" forged into the front, with "10 In." and "MFD. U.S.A." forged into the reverse, along with a "U56" forged-in code near the hanging hole (see lower inset). The overall length is 10.1 inches, and the maximum opening is 1.1 inches. The head thickness was measured at 0.54 inches. This wrench uses a press-fit pin to hold the adjusting knurl, rather than the threaded pin used in older production. The forged-in code "U56" is a Danielson date code, but currently we're unsure of the decade of production for this wrench. The "6" year code and ringed hanging hole could indicate production in 1966, 1976, 1986, or later. The interesting (even entertaining) early history of P&C is covered in our article on the P&C Hand Forged Tool Company. In this section we'll look at selected examples of P&C's later production, with the selection based the presence of the registered trademark symbol on the tool. Since the P&C-Logo wasn't registered until 1953, the trademark symbol should indicate production after that point. P&C remained in operation until about 1968. Fig. 56A. P&C 2528 3/4x7/8 Box-End Wrench, with Inset for Side View, ca. 1949 to Mid 1950s. Fig. 56A shows a P&C 2528 3/4x7/8 box-end wrench, stamped with the P&C-Logo on the shank, with the fractional sizes forged into small depressed panels ("size fields") at the ends. The overall length is 13.2 inches, and the finish is chrome plating. In this example the P&C logo is not yet marked with the registered trademark symbol, but the use of forged-in sizes in "size fields" indicates production during the Proto era. Fig. 56. P&C 1234 Compound-Leverage Slip-Joint Pliers, with Inset for Side View, ca. Mid 1950s to 1960s. The full patent number was found to be patent #2,600,512, issued to H.A. Mead in 1952. This patent was also used by Proto for its equivalent model Proto 234 Pliers shown in an earlier figure. Fig. 57. P&C 1243 10 Inch Tongue-and-Groove Pliers, with Insets for Marking Detail, ca. 1953+. Fig. 57 shows a pair of P&C 1243 10 inch tongue-and-groove pliers, stamped "Mfd. U.S.A." with the P&C-Logo and registered trademark symbol. The overall (extended) length is 10.3 inches, and the finish is chrome plating with polished faces. Both handles are marked with forged-in codes, though unfortunately both codes are very difficult to read (see insets). The lower handle appears to be "U.7.8", but the last digit is unclear, and the upper handle appears to be "7.8.U", a reordering of the other code. The tongue-and-groove plier design was invented in the early 1930s and sold under the well-known "Channellock" brand by the Champion DeArment Company. Based on a catalog review, P&C was offering tongue-and-groove pliers by 1953 (or earlier), and by 1961 these models were referred to as "Power Track" pliers in the catalogs. Fig. 58. P&C 1708 8 Inch Adjustable Wrench, with Insets for Side View and Reverse Detail, 1950. The overall length is 8.2 inches, and the maximum opening is 1.0 inches. The maximum head thickness was measured at 0.52 inches. The finish is chrome plating with polished faces. The forged-in code "H-11-0" is the Danielson Date Code for the tool. For this wrench, the "0" year code along with the plain hanging hole and no R-Circle symbol indicate production in 1950. Fig. 59. P&C 1708-S 8 Inch Adjustable Wrench, with Inset for Side View, 1955. Fig. 59 shows a P&C 1708-S 8 inch adjustable wrench, stamped with the P&C-Logo and a registered trademark symbol, and with "Forged Alloy Steel" in forged raised letters. The shank also has a forged-in code "P55" visible at the right. The forged-in code "P55" is the Danielson Date Code for the tool, and the "5" year code and plain hanging hole indicate production in 1955. Based on the 1955 production date, this wrench is currently our earliest P&C tool bearing the R-Circle trademark symbol. Fig. 60. P&C 1712 12 Inch Adjustable Wrench, with Insets for Side View and Marking Detail, 1956. Fig. 60 shows a P&C 1712 12 inch adjustable wrench, marked with the P&C logo and model number stamped on the shank, and with "12 In." and "Forged Alloy Steel" forged into the front. The shank also has a forged-in code "B.4.6" visible at the right near the hanging hole, and shown as a close-up in the middle inset. The overall length is 12.2 inches, and the maximum opening is 1.3 inches. The maximum head thickness was measured at 0.70 inches. The forged-in code "B.4.6" is the Danielson Date Code for the tool, and the "6" year code and plain hanging hole indicate production in 1956. With the 1956 production date we would have expected to see an R-Circle trademark symbol following the P&C logo, but apparently the trademark symbol was not yet consistently marked.